As it expands public-lands leasing in the area, the Bureau of Land Management denies “adverse effects” on cultural sites northwest of San Rafael Swell — while rock-art experts warn otherwise. (Al Hartmann | The Salt Lake Tribune) Rugged country of jumbled sandstone caprock in the Molen Reef area of the San Rafael Swell. 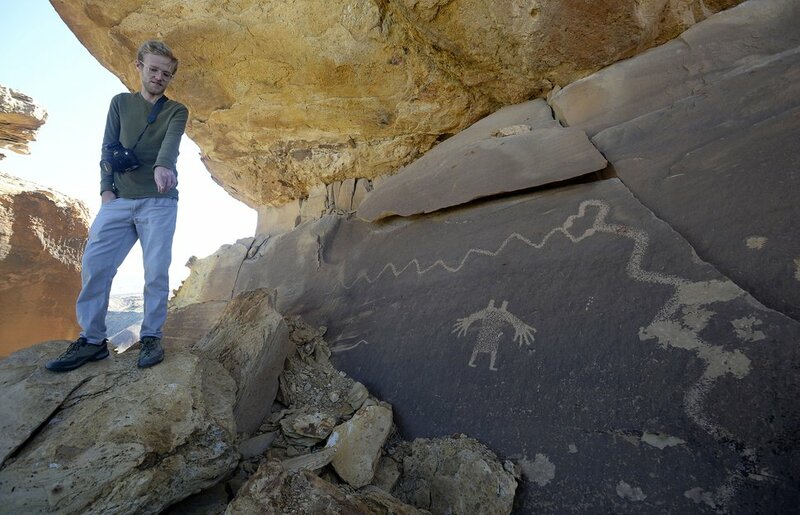 A series of oil and gas leases auctioned by the BLM could threaten parts of Molen Reef an area that rock art enthusiasts say is ripe with pictographs and other cultural artifacts. (Al Hartmann | The Salt Lake Tribune) Rugged country of jumbled sandstone caprock in the Molen Reef area of the San Rafael Swell. A series of oil and gas leases offered by the BLM could threaten parts of Molen Reef an area that rock art enthusiasts say is ripe with pictographs and other cultural artifacts. (Al Hartmann | The Salt Lake Tribune) Fremont rock art of antelope in the jumbled sandstone caprock in the Molen Reef area of the San Rafael Swell. A series of oil and gas leases offered by the BLM could threaten parts of Molen Reef an area that rock art enthusiasts say is ripe with pictographs and other cultural artifacts. (Al Hartmann | The Salt Lake Tribune) Rugged country of jumbled sandstone caprock in the Molen Reef area of the San Rafael Swell. A series of oil and gas leases offered by the BLM could threaten parts of Molen Reef an area that rock art enthusiasts say is ripe with pictographs and other cultural artifacts. (Al Hartmann | The Salt Lake Tribune) Rugged country of sandstone caprock in the Molen Reef area of the San Rafael Swell. A series of oil and gas leases offered by the BLM could threaten parts of Molen Reef an area that rock art enthusiasts say is ripe with pictographs and other cultural artifacts. (Al Hartmann | The Salt Lake Tribune) Photographer Jonathan Bailey passes by Fremont petroglyph of three figures high in the sandstone caprock in the Molen Reef area of the San Rafael Swell. He has been exploring and documenting pictographs and other cultural artifacts in the area. A series of oil and gas leases offered by the BLM could threaten parts of Molen Reef . (Al Hartmann | The Salt Lake Tribune) Photographer Jonathan Bailey stands near Fremont petroglyph of three figures high in the sandstone caprock in the Molen Reef area west of the San Rafael Swell. He has been exploring and documenting pictographs and other cultural artifacts in the area. A series of oil and gas leases offered by the BLM could threaten parts of Molen Reef. 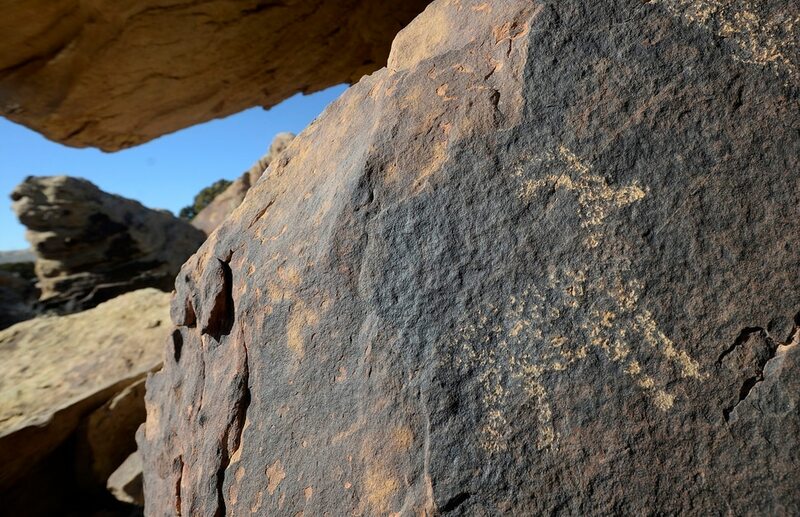 (Al Hartmann | The Salt Lake Tribune) Fremont petroglyph of snake and figurecalled Cowboy Secret tucked beneath jumbled sandstone caprock in the Molen Reef area of the San Rafael Swell. A series of oil and gas leases offered by the BLM could threaten parts of Molen Reef an area that rock art enthusiasts say is ripe with pictographs and other cultural artifacts. 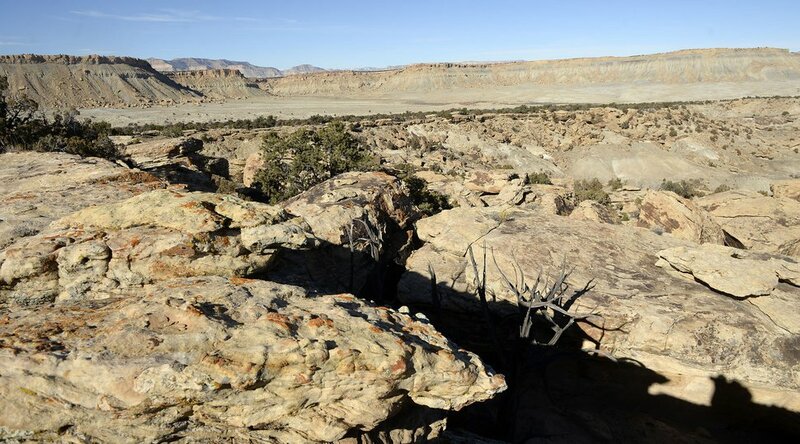 (Al Hartmann | The Salt Lake Tribune) Small Fremont corn graneries with the lids still intact tucked beneath a sandstone overhang in the Molen Reef area of the San Rafael Swell. A series of oil and gas leases offered by the BLM could threaten parts of Molen Reef an area that rock art enthusiasts say is ripe with pictographs and other cultural artifacts. (Al Hartmann | The Salt Lake Tribune) Photographer Jonathan Bailey explores and documents pictographs and other cultural artifacts in the sandstone caprock in the Molen Reef area of the San Rafael Swell. At lower left is a snake-like drawing on the dark sandstone. A series of oil and gas leases offered by the BLM could threaten parts of Molen Reef. (Al Hartmann | The Salt Lake Tribune) Fremont petroglyph of snake and figure tucked beneath jumbled sandstone caprock in the Molen Reef area of the San Rafael Swell. A series of oil and gas leases offered by the BLM could threaten parts of Molen Reef an area that rock art enthusiasts say is ripe with pictographs and other cultural artifacts. (Al Hartmann | The Salt Lake Tribune) Rugged country of jumbled sandstone caprock in the Molen Reef area of the San Rafael Swell. A series of oil and gas leases offered by the BLM could threaten parts of Molen Reef an area that rock art enthusiasts say is ripe with pictographs and other cultural artifacts. (Al Hartmann | The Salt Lake Tribune) Photographer Jonathan Bailey at Cowboy Secret a Fremont pictograph of a snake and figure tucked high in the jumbled sandstone caprock in the Molen Reef area of the San Rafael Swell. He has been exploring and documenting pictographs and other cultural artifacts in the area. A series of oil and gas leases offered by the BLM could threaten parts of Molen Reef . 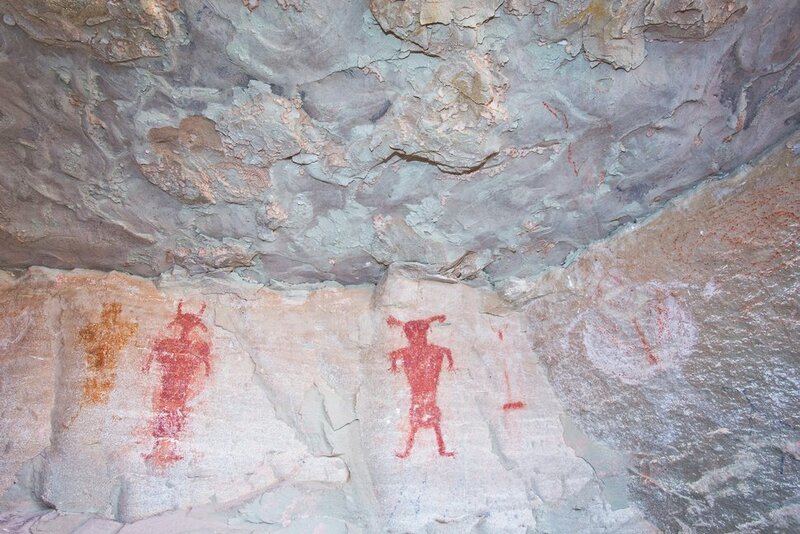 (Al Hartmann | The Salt Lake Tribune) Fremont petroglyph of three figures high in the caprock in the Molen Reef area of the San Rafael Swell. A series of oil and gas leases offered by the BLM could threaten parts of Molen Reef an area that rock art enthusiasts say is ripe with pictographs and other cultural artifacts. (Al Hartmann | The Salt Lake Tribune) Rugged country of jumbled sandstone caprock in the Molen Reef area of the San Rafael Swell. A series of oil and gas leases offered by the BLM could threaten parts of Molen Reef an area that rock art enthusiasts say is ripe with pictographs and other cultural artifacts. (Al Hartmann | The Salt Lake Tribune) Photographer Jonathan Bailey photographs a new pictograph he found beneath an overhang in the Molen Reef area of the San Rafael Swell. The small block figures aren't necessarily spectacular but still worth documenting. A series of oil and gas leases auctioned by the BLM could threaten parts of Molen Reef . (Al Hartmann | The Salt Lake Tribune) Photographer Jonathan Bailey at Cowboy Secret a Fremont petroglyph of a snake and figure tucked high in the jumbled sandstone caprock in the Molen Reef area of the San Rafael Swell. He has been exploring and documenting pictographs and other cultural artifacts in the area. A series of oil and gas leases offered by the BLM could threaten parts of Molen Reef. Ferron • As he scanned the horizon in a shallow basin under central Utah’s Molen Reef, Jonathan Bailey’s eye fell on red markings he had never noticed before despite numerous forays into the area searching for ancient rock art. Drawing closer, the Ferron native discovered two prehistoric square human figures outlined under an overhanging rock. 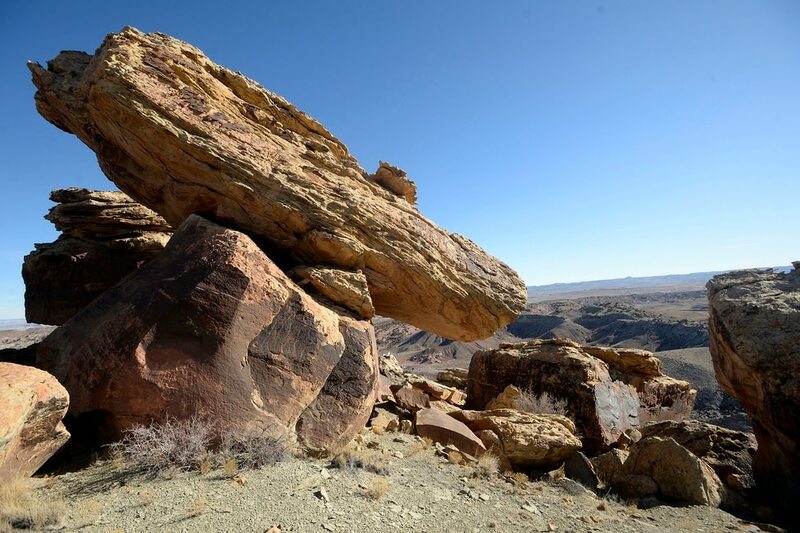 Add another Fremont rock art site to the long list he has documented and provided to the Bureau of Land Management, which is now leasing the part of Emery County for oil and gas development over the objections of historic preservation, tribal and environmental groups. “It’s overlooking this broad area where people could consider leasing. Without the full protections of the National Register [of Historic Places], they could place an oil rig 150 feet from this site,” Bailey said. Rock art aficionados have deep concerns about the impact of energy development on the petroglyphs that ancient Americans pecked into the region’s sandstone boulders centuries ago. They agree wells can be placed so they don’t obliterate rock art, but transportation routes needed to serve oil and gas extraction would inevitably follow the very washes used by ancient Americans who carved their art along the paths they traveled. “Where they put roads will destroy the resources,” said Diane Orr of the Utah Rock Art Research Association, or URARA, which protested these leases. 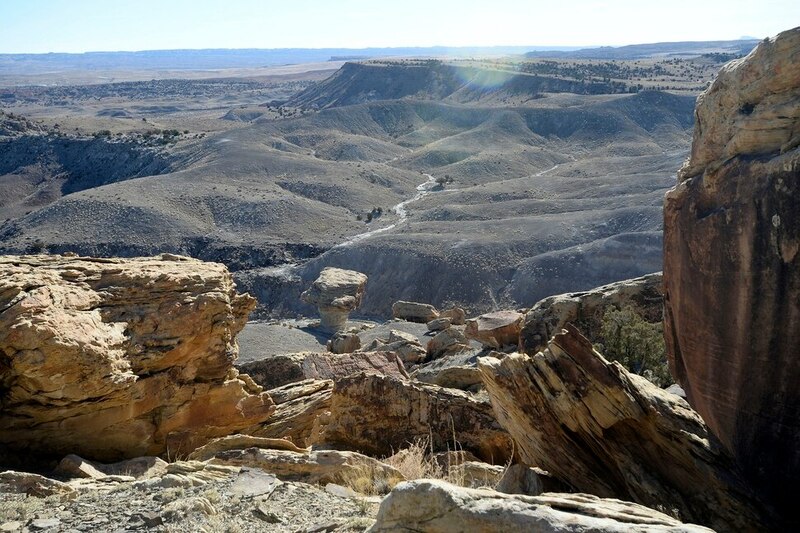 The 32,000 acres recently approved for BLM mineral leasing are nestled between San Rafael Swell and Molen Reef, a mesa that stretches along a north-south axis east of Emery County towns strung along State Route 10. The BLM had planned to sell leases in the area in 2013, but then-Utah state director Juan Palma instead shelved them after hearing a direct plea from Orr and her associates. The land was later incorporated into a “master leasing area” in an ambitious, but ultimately doomed effort by the Obama administration to better guide drilling on public lands with strong scenic and recreational value. President Donald Trump’s new Interior Secretary, Ryan Zinke — under orders to lift barriers to energy development — has since jettisoned the program and axed planning for several Utah areas near national parks and monuments. When Palma first withdrew the Molen Reef area in 2013, his idea was to give Orr’s rock art group time to locate sites so the BLM would have a better picture of rock art locations before selling leases. Bailey, a 22-year-old photographer who grew up in Ferron, threw himself into the task and has since documented dozens of sites that were previously unknown. In the meantime he published a book about the Colorado Plateau titled “Rock Art: A Vision of a Vanishing Cultural Landscape” featuring numerous photographs he shot near Molen Reef. (Al Hartmann | The Salt Lake Tribune) Photographer Jonathan Bailey at "Cowboy Secret" a Fremont pictograph of a snake and figure tucked high in the jumbled sandstone caprock in the Molen Reef area of the San Rafael Swell. He has been exploring and documenting pictographs and other cultural artifacts in the area. A series of oil and gas leases offered by the BLM could threaten parts of Molen Reef . Bailey’s findings support protests against the BLM’s recent decision to approve lease offerings in the area. Last week, the agency overruled the protests filed by URARA and others, a decision that the environmental group Southern Utah Wilderness Alliance intends to challenge. Last month, the BLM put 15 parcels east of Molen Reef up for auction, but none received the minimum $2-an-acre bid, a sign that industry is not that bullish on drilling, despite its repeated demand that the BLM lease these lands. The next day, an outfit called Liberty Petroleum bought the three most sensitive leases, totaling 4,934 acres, over the counter for $1.50 an acre. For his $7,401 investment, plus $1.50 an acre in annual rent, Liberty principal Gregor Klurfeld of Great Neck, N.Y., acquired rights to drill the lands under certain limits. Contacted last month by The Salt Lake Tribune, Klurfeld declined to be interviewed. While his intentions for these parcels remains unclear, his track record indicates a history of holding on to leases without developing them. The BLM once tried unsuccessfully to rescind some of Klurfeld’s federal leases because he failed to engage with neighboring leaseholders who wanted to join together, or “unitize,” all the leases in a particular area. And state trust lands records show that the New York resident has held 87 state leases over the years, but they have been revoked for failure to pay annual rent. Noting that the Molen area has shown little promise for oil and gas in the past, Emery County leaders have endorsed leasing on lands there as a necessary step to ensuring “judicious development” of all the county’s resources. (Al Hartmann | The Salt Lake Tribune) Rugged country of sandstone caprock in the Molen Reef area of the San Rafael Swell. A series of oil and gas leases offered by the BLM could threaten parts of Molen Reef an area that rock art enthusiasts say is ripe with pictographs and other cultural artifacts. For its part, the BLM says federal law obligates the agency to analyze lands nominated for leasing and offer them at auction if it is found that leasing won’t harm non-energy resources. Although two predecessors declined industry requests to offer Molen, current state director Ed Roberson concluded leasing would result in “no adverse effects” to the rock art. “The BLM-Utah completed the most intensive pre-lease inventory survey that we have ever done, which Utah [State Historic Preservation Office] concurred with,” spokesman Ryan Sutherland wrote in an e-mail. The BLM says it will conduct an analysis of the site before work on the ground can occur. The Molen Reef parcels feature special cultural-resource rules that allow BLM to modify proposals. But these measures fail to reassure historic preservationists because they contend BLM has yet to inventory rock art sites around Molen Reef. 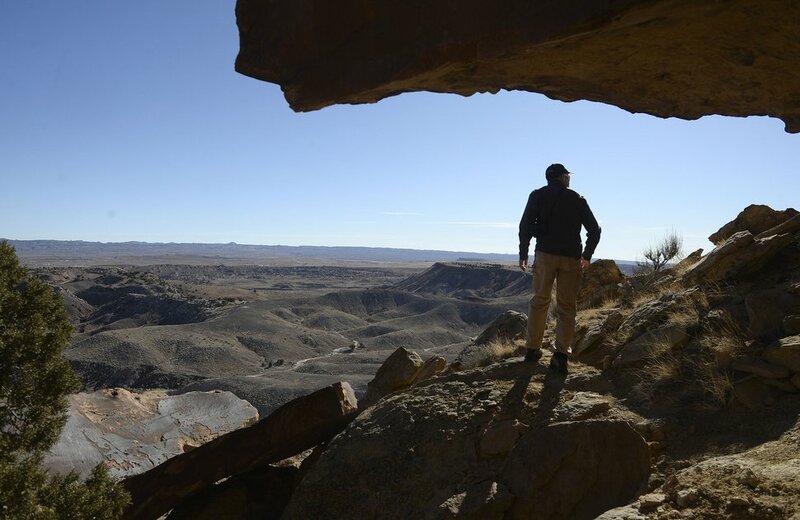 And once a lease is issued, the BLM is contractually obligated to accommodate extraction of its hydrocarbons, said Blaine Miller, who worked as an archaeologist in the BLM’s Price field office until he retired five years ago. (Courtesy of Jonathan Bailey | Bailey Images) Images of rock art located in the western reefs of Utah's San Rafael Swell, on parcels offered for oil and gas leasing by the BLM. These painted figures are found in a low-to-the-ground shelter within the proposed lease parcels. They are attributed to the Fremont culture. During the George W. Bush administration, Miller helped create and map five Areas of Critical Environmental Concern, or ACECs, in the Price office’s 2008 resource plan section devoted to protecting rock art. These worm-shaped land designations follow washes that were thought to feature the high concentrations of rock art. No surface occupancy is allowed inside the areas, but Miller now believes the critical-concern maps fail to include the places with the most rock art. The zones of protection were based on educated guesses of where archaeologists expected rock art to be, but on-the-ground surveys by Bailey and others hired by URARA, such as Steve Manning, are documenting numerous sites outside them. While activists and bureaucrats argue over whether drilling would degrade Molen Reef’s ancient treasures, Bailey continues his work searching for rock art on foot, sometimes taking great risks. When he finds a site, he takes a pictures and records its description, size, condition, location, distance off the ground, and the direction it faces. Bailey’s roots go back many generation in Emery County. From a young age he roamed the rugged, empty lands east of his hometown. At 13 he discovered an intact basket, which held a pot and was bound together with rabbit cordage. It was later recovered by archaeologists and is now on display at the Museum of the San Rafael in Castle Dale. The area may be rich in rock art and “lithic scatters” of stone artifacts, pot and arrow fragments, but it lacks evidence of permanent habitations other than small granaries tucked under overhanging rocks. The pattern suggests the area was used seasonally. Earlier this month, Bailey visited a site known locally as Cowboy’s Secret in one of the leased parcels. The spot is visible for miles in every direction. Under a pair of precariously balanced boulders is a petroglyph of a horned figure with a tiny head and monstrous hands, appearing to conjure a snake wrapping around the rock. (Al Hartmann | The Salt Lake Tribune) Rugged country of jumbled sandstone caprock in the Molen Reef area of the San Rafael Swell. A series of oil and gas leases offered by the BLM could threaten parts of Molen Reef an area that rock art enthusiasts say is ripe with pictographs and other cultural artifacts. Its meaning has been lost to the winds of time, which may be why archaeologists shy away from rock art. These artifacts don’t lend themselves scientific measurement, but to Bailey, they open up myriad stories. Looking far to the east from Molen Reef, the horizon ends at the San Rafael Swell’s distinctive sandstone reefs. Overlooking that view is a rock art image Bailey has seen repeated around the Molen area, but nowhere else. It shows three figures with linked arms, in what Bailey suspects signifies an alliance among ancient clans. Perhaps we will never know what such images meant for the people who left them, he said, but he believes they provide clues how the ancients viewed the world they inhabited. In his book, the young photographer builds a case that rock art animates the landscape with its hidden meanings.